A new smartphone from Xiaomi has been leaked in benchmarks, revealing high end specs. This smartphone from Xiaomi has been codenamed Blackshark, probably built by Black Shark Technology Inc, a firm in which Xiaomi has invested recently according to the company’s website. The teaser on the Blackshark website shows that the smartphone seems to be a dedicated gaming smartphone, featuring high-end hardware. There are some basic specifications which also have been revealed from the AnTuTu benchmark screenshots. 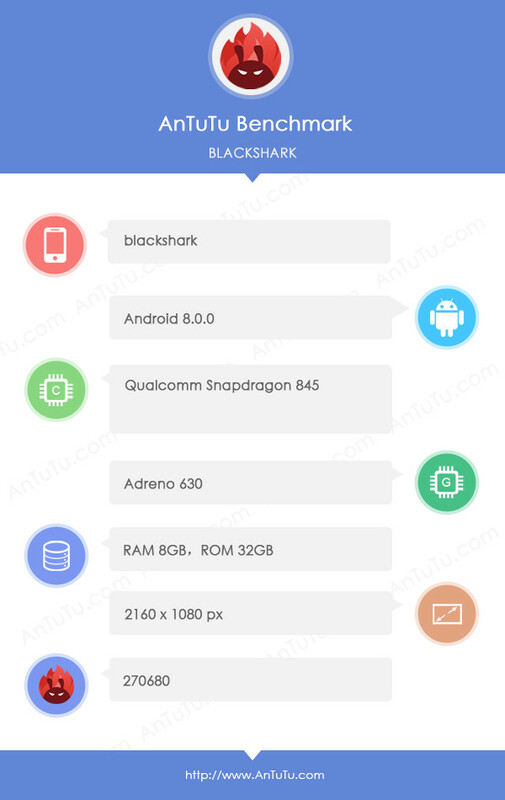 The benchmark screenshot reveals that the Blackshark smartphone will come preinstalled with Android 8.0 Oreo, but details are scant about the phone’s UI – whether it will come with MIUI or not is not known yet. The smartphone will sport the new Qualcomm Snapdragon 845 SoC coupled with the Adreno 630 GPU. For multitasking and lag-free gaming, the smartphone will feature 8GB RAM and 32GB internal memory will be provided. The display size has not been revealed yet but according to the resolution of the display we see in the screenshot, we can assume the display aspect ratio. The display resolution is FHD+ (2160 x 1080 px) which is an 18:9 aspect ratio which confirms that the smartphone will sport a FullVision display with thin bezels. The Blackshark scored 2,70,680 points on AnTuTu which is impressive. However, the use of a Full HD+ display might have helped the phone in getting a better score. Reports further suggest that the Xiaomi Blackshark display could come with 120Hz refresh rate, making it one of the few non-Japanese smartphones to feature this high refresh rate technology. Given its focus on gaming, this claim does not seem too far fetched, but we may have to wait a while before more details are revealed.